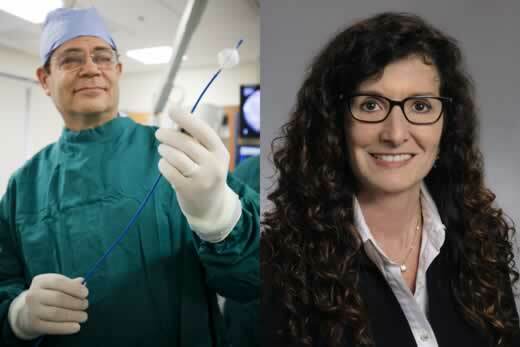 Jonathan J. Langberg, MD, and Barbara O. Rothbaum, PhD, have been named fellows of the National Academy of Inventors (NAI). They will be inducted in April 2018 during the NAI’s 2018 annual conference in Washington, D.C.
Election to NAI fellow status is a high professional honor bestowed to academic inventors who have demonstrated a prolific spirit of innovation in creating or facilitating outstanding inventions that have made a tangible impact on quality of life, economic development and the welfare of society. Langberg is a professor of medicine in the Division of Cardiology and section director of clinical cardiac electrophysiology for Emory University School of Medicine. He specializes in arrhythmias, atrial fibrillation and implantable defibrillators and pacemakers. Langberg is a pioneer in the development of radiofrequency ablation. He directed the development of Emory’s two-year Clinical Cardiac Electrophysiology (CCEP) Fellowship Training Program. He also served as consultant to the Accreditation Council for Graduate Medical Education helping draft the original CCEP accreditation guidelines. For nearly 20 years, Langberg has sat on scientific advisory boards for M.V. Medical Devices, St. Jude/Pacesetter, and was co-founder and senior scientific advisor to Atrionix, Inc. He has served as author and co-author of 139 peer-reviewed publications and 153 abstracts. He has also authored 10 book chapters and participated in 50 invited lectures. Langberg finished clinical training at the University of California at San Francisco, where he completed fellowships in cardiology and clinical cardiac electrophysiology. He has been in practice for 33 years. Rothbaum is a professor in the Department of Psychiatry and Behavioral Sciences and director of Emory Healthcare's Veterans Program. She is the director of the Emory Healthcare Veterans Program and the Trauma and Anxiety Recovery Program at Emory University School of Medicine. Rothbaum serves as the Department of Psychiatry’s Associate Vice Chair of Clinical Research. Rothbaum is a clinical psychologist who specializes in research on the treatment of individuals with anxiety disorders, focusing in particular on Post-Traumatic Stress Disorder (PTSD). She is a pioneer in the application of virtual reality exposure therapy to the treatment of psychological disorders. Rothbaum has served as a Blue Ribbon Panel Member for Pentagon officials since 2009 and served on the committee for the Institute of Medicine’s (IOM) Study on Assessment of Ongoing Efforts in the Treatment of PTSD. Author of over 300 scientific papers and chapters, Rothbaum has published five books on the treatment of PTSD and edited three others on anxiety. Rothbaum received the Diplomate in Behavioral Psychology from the American Board of Professional Psychology. She has served on the board of directors and as past president of the International Society of Traumatic Stress Studies (ISTSS) and as associate editor of The Journal of Traumatic Stress. With the election of the 2017 class of 155 fellows. there are now 912 NAI Fellows, representing more than 250 research universities and governmental and non-profit research institutes. The 2017 Fellows are named inventors on nearly 6,000 issued U.S. patents, bringing the collective patents held by all NAI Fellows to more than 32,000 issued U.S. patents. The 2017 NAI Fellows will be highlighted with a full-page announcement in The Chronicle of Higher Education 19 Jan. 2018 issue, and in an upcoming issue of Science and Technology and Innovation, Journal of the National Academy of Inventors.